If your order weighs less than 13 ounces, save huge on shipping with USPS first class (with tracking number). This product weighs 6 oz. 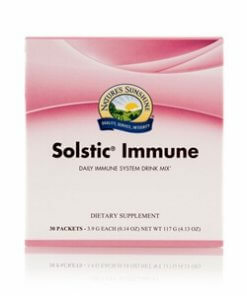 Nature’s Sunshine Solstic Immune provides immune support for on-the-go individuals. We get it–life is busy. And sometimes it’s too busy to think about boosting your immune system until you start coughing and sneezing. That’s why we created Solstic Immune, an immune boost in a convenient drink stick packet that you can take with you wherever you go. Its key ingredients are elderberry fruit extract, Echinacea purpurea, and vitamin D3, all of which have been shown to support the immune system. Solstic Immune also contains arabinogalactan and beta glucans, which stimulate natural killer cell and macrophage activity; Panax ginseng, another promoter of natural killer cell activity; vitamin C, long known for its role in maintaining a healthy immune system; zinc, responsible for neutrophil, natural killer cell and T- and B-lymphocyte function; and blueberry, blackberry, raspberry, and cranberry fruits, which are full of antioxidants and anthocyanins to help boost the immune system. No matter how busy life gets, grab a Solstic Immune packet and keep those defenses strong. 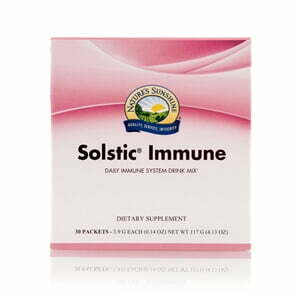 Instructions: For daily immune support, empty the contents of one Solstic Immune packet into 14–16 oz of cold water, mix, and enjoy. SCFOS (short-chain fructooligosaccharides), citric acid, natural citrus sweetener, natural flavors (citrus, raspberry), malic acid, and stevia leaf extract (Stevia rebaudiana).